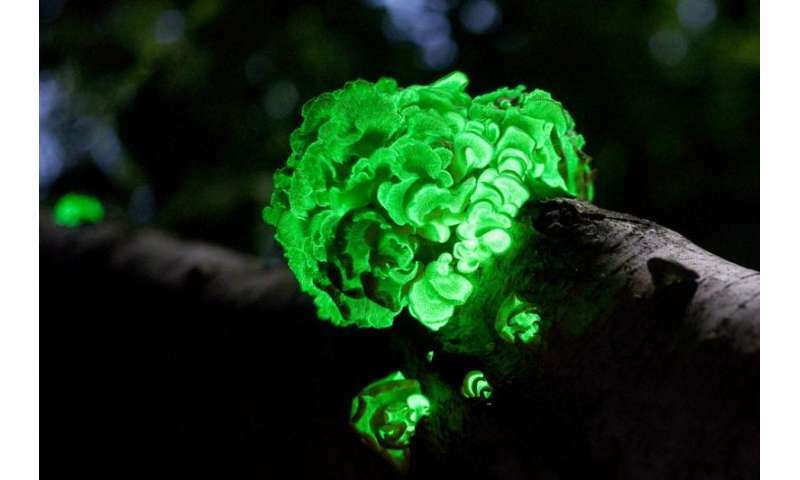 Foxfire, the greenish light given off by special fungi in the dark of the forest, was once regarded as magic. Today we know that it comes from bioluminescence, like the glow of a firefly. A team of Russian and Japanese scientists has now unravelled the previously unknown chemistry responsible for the glowing fungi. As they report in the journal Angewandte Chemie, the luminescence of many, if not all, fungi is based on the antioxidant hispidin. A hydroxylase enzyme converts the hispidin to a substance that glows when it is further oxidized by another enzyme. At the end of the 19th century, Frenchman Raphael Dubois found a substance in luminous beetles that is consumed in a reaction that produces light. He used hot water to extract this substance ("hot extract"), which he called luciferin (light bringer). Luciferin does not luminesce alone; it requires a second component that is destroyed by hot water and must be extracted cold ("cold extract"). Dubois named this substance luciferase. Today, the "glowing substances" from bioluminescent organisms are generally known as luciferins, and their corresponding enzymes are known as luciferases. It remained unclear exactly which luciferin/luciferase system causes fungi to luminesce. The luminescent substances from fungi are completely different from those found in fireflies. Researchers from Krasnoyarsk, Moscow, and Nagoya, led by Josef I. Gitelson and Ilia V. Yampolsky, have now solved this puzzle: The breakthrough came when the scientists, were studying the hot extracts from a series of nonluminescent fungi. Some fractions began to glow when mixed with the enzyme-containing cold extracts from luminescent fungi. In these fractions, the researchers found luciferin precursors. The concentrations of these compounds were about 100 times as high as in luminescent species, where the luciferin precursors can't accumulate because they are constantly being consumed in the luminescence process. By using a variety of separation techniques and spectroscopic methods, the team was able to identify the luciferin precursor as hispidin, a fungal metabolite known to be a strong antioxidant with antidiabetic and antitumor effects. The researchers were also able to find hispidin in four types of luminescent fungus that are barely genetically related. What makes a fungus able to luminesce isn't hispidin alone; it is the ability to produce the two enzymes necessary for bioluminescence. The researchers were able to extract these two enzymes from the biomass of luminescent fungi: The first is hispidin-3-hydroxylase, which converts hispidin to the actual luciferin, 3-hydroxylhispidin, by means of a hydroxylation reaction that also involves NADPH. This discovery overturns a 50-year-old doctrine that assumes that the precursor undergoes a reduction reaction to form the luciferin. The second enzyme is the luciferase, which catalyzes the oxidation of the luciferin to produce the luminescence. "This discovery overturns a 50-year-old doctrine that assumes that the precursor undergoes a reduction reaction to form the luciferin. The second enzyme is the luciferase, which catalyzes the oxidation of the luciferin to produce the luminescence." The overturned doctrine is one that linked mutations and natural selection to the evolution of biodiversity. The facts link metabolic networks and genetic networks via RNA-directed DNA methylation and fixation of RNA-mediated amino acid substitutions that differentiate all cell types in all individuals of all genera via the physiology of reproduction. You have no idea just how stupid you are.